Because this sculpture was geometric it was pretty to figure out its volume. I cut a one foot block of snow out of it to measure the weight of a single cubic foot of snow. It weighed in at 28 pounds! (I took my bathroom scale outside and weighed myself with my boots, coat and snow shovel. The total weight was 212 lbs. All that plus the one foot block of snow was 240. The difference was 28lbs. I divided the garage into four shapes to calculate the cubic feet each occupied. The first shape was the bulk of the garage under the larger roof. It was 14 feet wide by eight feet deep and 4.5 feet high. Multiply those three figures (if I remember my volume calculation correctly) and you get 504 cubic feet. The volume below the roof but above the larger garage was four feet high so I multiplied 14 by 8 by 4 (height above the bulk of the garage) and then because the roof was only half this volume divided the result by 2 for 112 cubic feet. Then I calculated the volume of the smaller "push out" garage space below the roof. That was 4.5 (height) by 2.5 deep by 7 feet wide. That equaled 78.75 cubic feet. Finally I calculated the area above the push out was 2,5 times 7 times 2 (height) divided by 2. The result was 17.5. Adding the four figures yeilds 712.25 cubic feet. Multiply that by 28 lbs. and the product is: 19,943 lbs. Divide that figure by 2000 lbs or one ton and the sculpture wieghed 9.97 tons! Throw in the eves which I didn't calculate and it gets close to ten tons even. This is not the biggest sculpture I've made and this was built in the backyard. 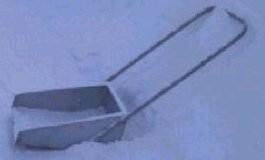 I usually build my snow sculptures in the front yard which means I have to use my snow scoop to push the snow from the back of my house to the front. I used almost all the snow in my back yard to build this. The snow was about two feet deep when I began. Over two days I piled up the snow in a period of about eight hours. The toughest part on my back was heaving the snow over my head to the top of the larger roof.